NEOTECH produces online NEO MDVRs, fully supported in the system Wialon, including live video streaming feature and saving archive video to the system. Recently a lot of inquiries have been received from international Gurtam partners, who want to use video recording and remote video surveillance functions in their projects. To make setting up our equipment more convenient, we have added the choice of the interface language in our proprietary configuration software. At the moment, the interface is implemented in Russian, English, French and Spanish. 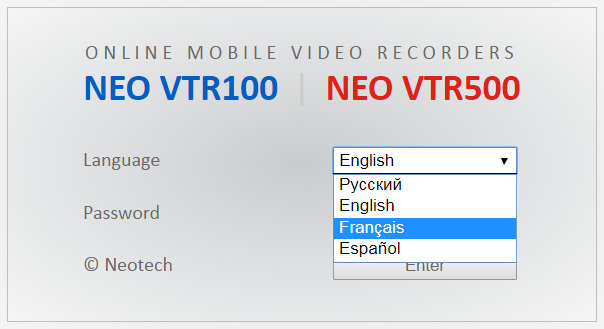 Now users from different countries can easier configure and use all the functions and capabilities of the equipment NEO MDVRs in Wialon. If you need to add another language interface, you can contact the technical support department of the company NEOTECH.